While there are many reasons to love the Fab Four, there is one reason you may not have known, which is that the Beatles helping champion the use of cannabis. Even though there has been progress in the legalization of cannabis, it hasn’t been enough, which is why the fight and debate continues. That has seen today’s movie and music stars speak out about its use as both a medicinal aid and recreational drug. But The Beatles were some of the first to do so, voicing their opinion on it, half a century ago. 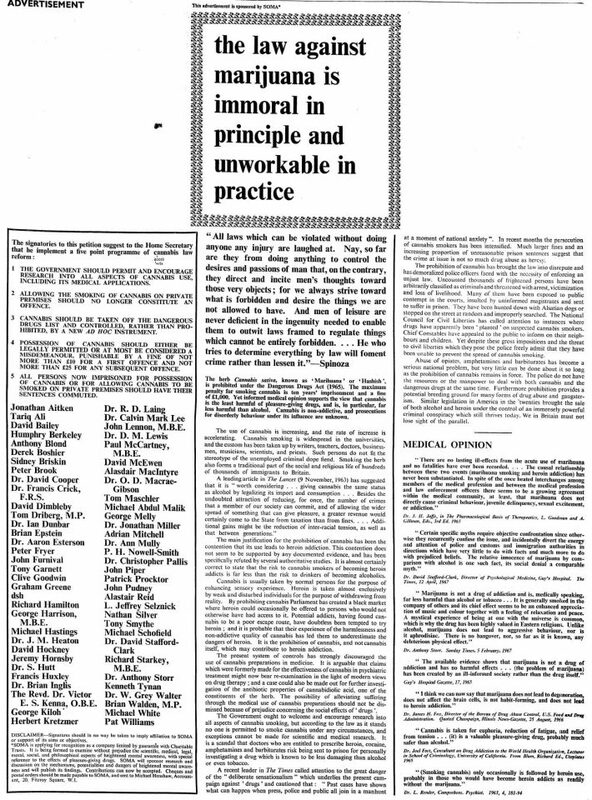 As archived by the Beatles Bible, the Fab Four and their manager Brian Epstein were five of 64 signatories – most of whom were then Britain’s most recognized names – of a full-page ad taken out in the London Times on July 24, 1967. The advertisement was prompted by the arrest of acclaimed photographer and International Times founder, John Hopkins, which saw him sentenced to nine-months in jail for possession. The group, which included the band, sought to call attention to what they deemed an unnecessarily harsh public policy. The law against marijuana is immoral in principal and unworkable in practice. The advertisement also argued that weed is “the least harmful of pleasure-giving drugs,” and “in particular, far less harmful than alcohol,” which is as true now as it was then. Cannabis smoking is widespread in the universities, and the custom has been taken up by writers, teachers, doctors, businessmen, musicians, scientists and priests. Such persons do not fit the stereotype of the unemployed criminal dope fiend. While the ad didn’t lead to the legalization of cannabis in the United Kingdom, it did see a public discussion, which resulted in small changes in the country’s drug laws. Those changes meant that citizens faced five years in the clink, instead of the maximum 10 years. Even though the band never attended the meeting that led to the ad being published, the signatures were still included with their full backing, which even went so far as Paul McCartney paying for its placement. 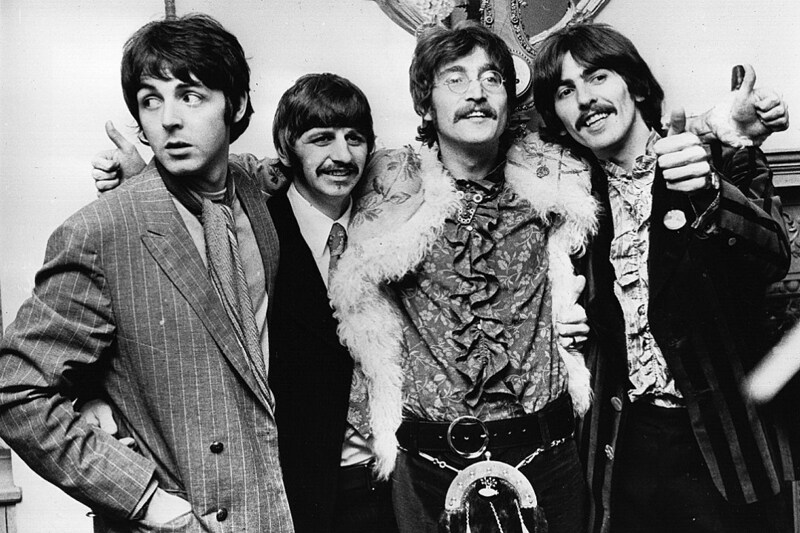 So, just how did John, Paul, George, and Ringo learn about the benefits of weed? That was thanks to Bob Dylan, who introduced the band to the joys of smoking your favorite herb. As noted in another entry in the Beatles Bible, during a meeting in a New York hotel on August 28, 1964, it was Dylan who suggested that they spark up. After the hotel room was secured, Dylan rolled the first joint and passed it to Lennon. He immediately gave it to Starr, whom he called “my royal taster.” Not realising the etiquette was to pass it on, Ringo finished the joint and Dylan and Aronowitz rolled more for each of them.